The oak tree was sacred to the peoples of ancient Europe. The Greeks dedicated it to Zeus and the Romans, to Jupiter. To the Celts as well, the oak was sacred; in part this was because it was one of the trees that hosted mistletoe. The mistletoe is believed to have been the Golden Bough of Aeneas, the mythic ancestor of the Romans. In the ancient tale the hero Aeneas consults the prophetess, one of the Sybils at Cumae. The Sybil tells Aeneas to break a branch from a certain tree that is sacred to Juno Inferna (Proserpina). Then Aeneas is led to the entrance of the Underworld, where he descends. Aeneas approaches the Stygian lake that Charon will not ferry him across because he is not dead. The Sybil who accompanies Aeneas then produces a Golden Bough that allows Aeneas entrance into the Underworld. Some scholars believe this bough was mistletoe. This tale is similar to the one of the Celtic hero Bran who is guided by a fairy woman, bearing the Silver Branch, through which he gains admittance to the Fairy Realm. The Golden Bough, like the Silver Branch, is a passport to another realm. Also, in Celtic lore, mistletoe bears fruit at the time of the Winter Solstice, the birth of the new year, and may have been used in solstitial rites in Druidic Britain as a symbol of immortality. Yet again, for the Norse, mistletoe was the plant which the giant Loki used to kill Baldur, the Norse Apollo, god of light and beauty. Today, however, it is another of the plants that the oak tree harbors that will concern us: oakmoss. Oakmoss is a lichen, Evernia prunastri, which grows on oak trees and a few other deciduous trees and on some conifers, such as firs and pines. Oakmoss also happens to be one of the most historically important materials used in perfumery. It plays a crucial role in two of the principal genres of perfumery, the chypre and the fougère. In the first of these, the chypre, it combines with bergamot, a green citrus note produced from the rind of a citrus variety grown in southern Italy, and labdanum, derived from a resinoid of another Mediterranean plant, the cistus labdanum of Spain and Crete; in this combination, it forms something that is unlike any of the three in isolation. This is the "ghost note" which mysteriously appears only when the three are combined. Oakmoss creates a similar "ghost note" effect in combination with coumarin and lavender to produce the classic fougère accord, producing a radically different impression from the chypre, but with a similar mysterious evocation of something not present in any of the three constituent materials alone. By itself, oakmoss has a distinctive, somewhat sharp or bitter, woody odor, that is at the same time mossy, slightly sweet, and reminiscent of earthy, humus smells. Like many substances that are high in resinoid content, it is isolated by the volatile solvent extraction method. This produces a concrete from which the absolute is extracted by washing with alcohol. Solvent extraction tends to produce oils with a finer fragrance than steam distillation, so it is much favored in the perfumery industry. Because it does not involve heat, there is less risk of damage to the oil than in distillation. It is also more likely to extract the heavier components, however; not only the oil, but other constituents such as waxes and plant dyes are extracted. The plant material is soaked in a solvent such as petroleum ether or hexane, which dissolves out the essential oil. The mixture of solvent and oil is then passed into a distillation vessel, where very gentle heat is applied — just enough to evaporate off the solvent. The mixture of essential oil and other components such as resins is known as a concrete. This concrete is then gently warmed with some alcohol at a temperature just high enough to melt it. The essential oil and a small proportion of the resins and waxes will dissolve in the alcohol. The resulting alcoholic solution, or tincture, then undergoes vacuum distillation. This removes the alcohol, leaving an absolute. In addition to its use in chypre and fougère scents, oakmoss is also used to give depth and refinement to woody and oriental compositions. Orientals use oakmoss to particularly good effect to combine smoothly with resinous, vanillic, and spicy notes and help them work together in tighter accords. Oakmoss is also effective in another way in perfumes: as a base note and a resinous material, it is an excellent fixative; this anchors the other notes in the perfume composition and gives them more longevity and depth. Unfortunately, oakmoss is an allergen to some people, producing sensitization of the skin. For this reason, the International Fragrance Association (IFRA) recommends that perfumes should not contain more than 0.1% oakmoss absolute, and that it should not exceed 1% of the total odorant material in the composition. Nowadays, there are "rectified" forms of oakmoss resinoid that are specially made to exclude the allergen. One of these is Oakmoss Givco 214, described as "a safe, synthetic oakmoss reconstitution… (which) accurately reproduces the effect of natural oak moss" and is "not subject to IFRA restrictions." The description goes on to say that it can be used at the same dosage levels as natural oakmoss extract, and that it provides "warmth and volume to chypre and woody accords." Apparently, if these claims are justified, we can look forward to future unrestricted enjoyment of oakmoss in perfumes. It may be worth noting, however, that the descriptions say nothing about its effectiveness in fougère compositions. Others claim that the whole IFRA safety scheme is a means for the synthetics companies to restrict the use of natural materials and improve the market for their own creations. This may simply be a bit of cynicism or paranoia, but there is no doubt that these companies maintain a lobby with the European central administration in Brussels, and that IFRA recommendations have been enacted into EU law before now. However that may be, I prefer to think of oakmoss in the way this post began: its association with the sacred oak tree of the ancients and with mistletoe... the exotic romances of the Golden Bough, the stories revolving around the search for passage into other kinds of life, rumors of sacred ritual and even of foul treason and murder. For me, the proper realm of perfume is imagination, romance, myth, and mystery. Can you blame me? Even so, a strong dose of good information keeps us grounded in the real world and informs our choices, our tastes, and our appreciation of our aromatic quest. 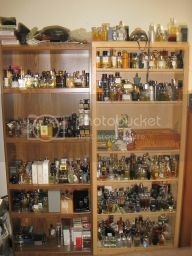 Both the nose and the imagination are necessary to the full and fulfilling enjoyment of scent. Hi Jaime, excellent info, although if you could help me. I am trying to use oakmoss essential oil to make perfumes and due to its viscosity its very difficult to handle also volume calculation is inaccurate, can i dilute the thick essential oil with a 75 proof vodka and later use it in its less viscous state. Will i have to readjust my note volume ratios as it will be little dilute?